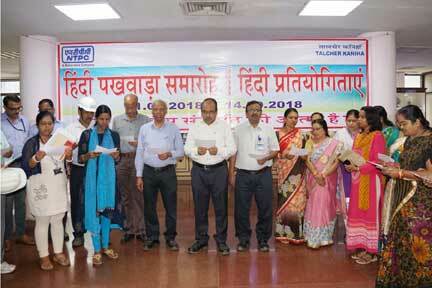 Kaniha: Hindi Pakhwada at NTPC Talcher Kaniha is being organized from Sept 1 to 15 ,2018.On the inaugural day Shri A K Tripathy, General Manger(I/C) administered the hindi pakhwada oath .He called upon employees to promote hindi in official use. On the occasion, senior officials and employees in large numbers were present during the inaugural programme. During the fortnight celebration ,competitions like hindi quiz ,rajbhasa quiz,hindi elocution ,hindi hand writing ,poem recitation ,painting completion and hasya kabi samellan will be held.It is expected employees and their family members including children will participate in the annual rajbhasa programme.